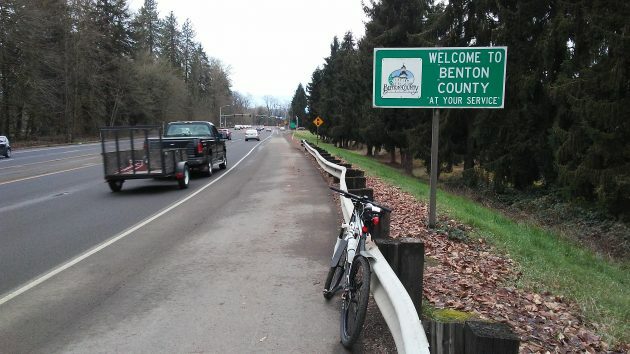 “Sanctuary county” likely won’t be added to the welcome signs of Benton County. For symbolism without substance, few actions will beat the “declaration of sanctuary” by the Benton County Board of Commissioners. Maybe the declaration makes some people feel better, but it changes nothing in the real world. Donald Trump has talked vaguely about sending illegal immigrants home. This is impractical, but what’s wrong with it in principle? Lately, though, his team has defined that goal as affecting mainly, or even only, those undocumented people who have committed crimes. There won’t be any federal program to register anybody based on their status as illegal aliens, their religion, or anything else. In practice, Benton County’s declaration changes nothing. Since 1987 Oregon has had a law barring state and local law enforcement from arresting anyone only for being in the country in violation of immigration laws. But the law specifically allows Oregon police to cooperate with federal authorities to verify the immigration status of anyone arrested for a criminal offense and to request information on people’s immigration records. In addition, the law allows Oregon police to arrest anyone the feds have charged with a criminal immigration offense. They can also arrest anyone named in a federal warrant. In short, the law allows state and local police to take normal law enforcement action regardless of a suspect’s citizenship status. There’s no sanctuary for crime. Yes, it may be “symbolism without substance,” but it serves a good purpose anyway. It’s an easily searchable indicator for lots of things, thanks to ever-increasing and highly consistent social/political polarization. Conversely, if I thought that bike paths were part of a globalist/commie plot to destroy freedom (must be true, heard it on the radio;), I could avoid such places with the same search. “Sustainable cities” and “ICLEI” will also work. I think you have missed the whole point of sanctuary. Yes Oregon law “allows….” but sanctuary has been applied such that local law officials will not contact ICE and will not hold those detained when requested by ICE. Albany actually did that under Chief Simons. I hope those communities doing that will be barred from all federal monies. TC, I need to clarify your position. My take from previous postings is that you objected to control by our current form of government and preferred something more like plebiscite. In this post, you seem to advocate using the Federal Goverment’s power to exert force on others. Sanctuary cities are not about protecting criminals. It us about protecting any person from those who are racist, xenophobic, bigoted, anti-any religion even if they are peaceful… because some people think that all Muslims are terrorists, and that is a fallacy. It is about protecting the rights of women, and of gays…who had no say so in the genetic code that made them gay. It is about the rights of human beings, period. To quote you, Hasso Herring, “if he hadn’t done the crime he wouldn’t be in court.” Wow…I’m sure you know better. There are a lot of people who go through a court procedure and are found innocent, because they ARE innocent. Of course you know that.Just a reminder to watch wording…. Entering the country without proper permission is a crime. The Albany City Council recently wasted an entire two-year period, refusing to allow recreational cannabis sales even after a majority of Albany voters approved Measure 91 in 2014. This is what I call “symbolism without substance” to paraphrase Mr. Hering. As such, it is difficult to see why Benton County’s stance on sanctuary seems to put an angry bee in Mr. Hering’s bonnet. The Benton County commission is at least standing with the rest of the Corvallis community against the upcoming onslaught of bigotry and racism that will begin emanating from Washington DC starting January 21st. I would think Mr. Hering would be more troubled by the absurd class action lawsuit being spearheaded by the Linn County commission with the intent of forcing the state to clear cut more mountain tops so timber companies can earn even larger profits. Certainly the Benton County actions are no more absurd or futile than those of Roger Nyquist and company over in Linn County.